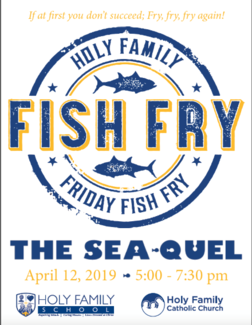 The Fish Fry Sea-quel needs you! Are you able to volunteer your time? Donate a dessert or two? Please see below to sign up to volunteer or make a donation for the Fish Fry on Friday, April 12th. The fry will be held in the Holy Family gymnasium from 5:00PM - 7:30PM. Let's show our support - wear Holy Family shirts! Help cook and prepare the hot and cold side dishes. Also will setup cold drinks. I would like to be the runner. Check out guest after they have picked up their food. Adults only. Please plan to arrive at 4:30 to get familiar with the register & cash handling. Control the flow of those into the buffet area and keep the line moving. Work the buffet tables. Arrive by 4:30pm. Monitor the children's area. Arrive by 4:45pm. 50/50 Raffle will be held this evening. Arrive by 4:30pm. Adults only. Work the dessert table. Arrive by 4:30pm. Dave and I can fill these two spors.